With the size of the site keeping the flora and fauna under control as well as basic upkeep of the building can seem like a never ending task for us. 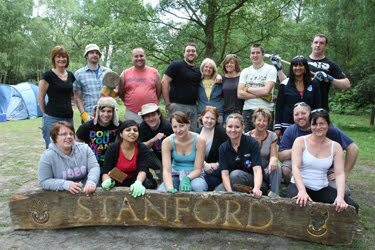 So if your business is looking for a new challenge and feel that a day out the office could be good for you we are happy to accommodate you on one of our volunteer days. Both Barclays Bank, Royal Sun Alliance and Southern Water have taken us up on the challenge and used the opportunity to encourage team building with their staff. Refreshment is provided throughout the day and we can arrange lunch with most opting for a BBQ to keep them going. There is also the option of camping over as well as taking advantage of the training centre should you wish to incorporate your team meeting into the day and to make sure you can keep in touch with the office WiFi is available. It is amazing how changing the surroundings can change many meetings for the better. When was the last time you has a team meeting around a Camp Fire. For more information please Contact District Commissioner Wendy Keeley to see how you could help us and for information about Corporate Volunteering in Scouting in Crawley.